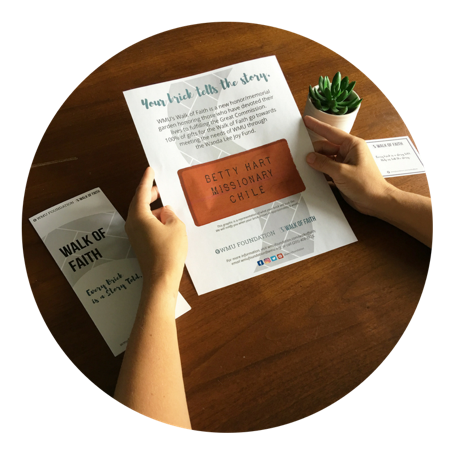 The Walk of Faith is an honor/memorial garden for those who love missions. Bricks will be laid at the national WMU building in Birmingham, Alabama. 100% of your purchase helps meet the operational needs of WMU. if you have questions or need help with your brick purchase. After you order a brick, you and the person you ordered the brick in honor of (or their family if you ordered in memory of someone) will receive a graphic representation of what the finished brick will look like by mail. If you tell us not to send this to the person or their family, we will only send this confirmation to you. 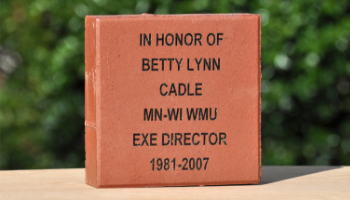 As soon as the actual brick arrives (8-10 weeks after ordering) you receive a picture of the brick, and the person you ordered it for (or their family) also receives the photo along with the story you wrote about how the person impacted your life. The WMU Foundation is recognized by the Internal Revenue Service as a 501(c)(3) non-profit organization. Contributions to the WMU Foundation are tax-deductible to the extent permitted by law.